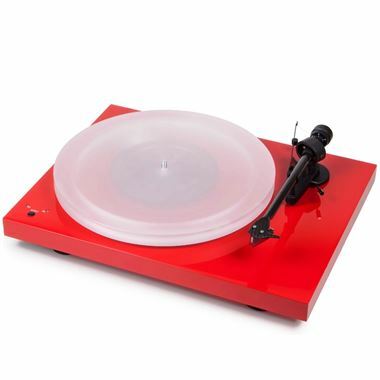 Project Debut Carbon Esprit SB inc. Perspex Dust Cover, speed control, Ortofon 2M Red cartridge. The all-new Debut Carbon Esprit SB turntable from Pro-Ject Audio takes the hugely successful, multi-award winning Carbon design and adds even more to the already impressive package. On top of the new 8.6CC carbon fibre tonearm, new power supply method, improved motor isolation, pre-installed Ortofon 2M Red and new cable junction box found on the standard Debut Carbon; the Esprit SB version also uses a totally new speed control principle to allow for easy changing between 33 1/3 RPM and 45RPM. The deck can also spin at 78 RPM by switching the pulley to the larger rung and setting the speed changer to '45/78' (Please Note: 78 RPM records require a special stylus - we recommend the 2M 78 Stylus for this turntable). As well as being convenient, the speed control system also allows for smoother motor operation - further reducing unwanted resonances along with the improved motor isolation. The new motor isolation system utilises a wholly unique rubber compound developed exclusively by Ortofon A/S to offer dramatically reduced resonance transference from the high-quality 9V motor the turntable employs. Another sonic benefit is found in the Esprit's included platter upgrade. Acrylic is a an excellent playback platform, as it offers almost no resonance in the audible frequencies and negates the need for a slipmat which can sometimes cause problems. The Debut Carbon Esprit SB is available in three stylish, high-gloss colours. Please Note: Product will vary slightly from image shown. The Esprit SB has a small speed-control mechanism built in to the top of the platter in the front-left corner (as you look straight on at the player). New images to follow soon.